«Durch die Nacht» is the first Feature Film by Antagonist Pictures, a group of young filmmakers from Zurich, Switzerland. Pre-production started in Summer 2013 after the completion of the screenplay by Andreas Elsener. The first castings took place in November followed by a second run in January. The main cast and crew is now almost complete. 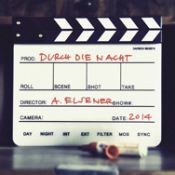 «Durch die Nacht» is a low budget project, cast and crew work without pay. Nevertheless, you need money to make a movie. Money for permits for shooting, for camera equipment, sound equipment and light equipment, for catering, for location renting and to pay travelling costs. And that’s why we need your support! Help us to realize «Durch die Nacht» and to bring Alex’ odyssey through night-time Zurich into movie theaters. If we reach our goal and financing is provided, shooting starts in August 2014. The film is set to be released in late summer 2015 and is planned to be shown in movie theaters and at various film festivals. This project ended successfully on 8/5/2014 12:00! You receive a download-link for the movie and your name will appear on the official «Durch die Nacht» website and Facebook page. You receive a download link for the movie and a signed postcard from a crewmember. Your name will appear on the official «Durch die Nacht» website. You receive a signed screenplay, a download link for the movie and your name will appear in the ending credits of the film and on the official website. You receive an invitation for a shooting day on location, a signed screenplay as well as a download link for the movie. In addition, your name will appear in the ending credits of the film and on the official website. You receive an invitation for a shooting day on location, a signed DVD, a signed screenplay and an exclusive «Durch die Nacht» city map that points out the locations of the movie. In addition, your name will appear in the ending credits of the film and on the official website. You receive an invitation for a shooting day on location and a unique extra role in the movie, a signed DVD, a signed screenplay and an exclusive «Durch die Nacht» city map that points out the locations of the movie. In addition, your name will appear in the ending credits of the film and on the official website. You receive two tickets for the official premiere of «Durch die Nacht» including a small aperitif and a signed DVD/Blu-Ray. In addition your name will appear in the ending credits of the film and on the official website. You receive two VIP tickets for the official premiere of «Durch die Nacht» including a small aperitif. In addition you receive a signed DVD/Blu-Ray of the film, a signed screenplay, an exclusive «Durch die Nacht» poster and a copy of the soundtrack. Also, you will be mentioned as sponsor in the ending credits of the film as well as on the official website. You will participate in a night time walk through Zurich accompanied by parts of cast and crew. You will walk in the footsteps of the protagonist, Alex, and visit a bar which served as a shooting location for the movie (including a drink and an exclusive «Durch die Nacht» city map that points out the locations of the movie). In addition you receive a signed DVD/Blu-Ray of the film, a signed screenplay, an exclusive «Durch die Nacht» poster and a copy of the soundtrack. Also, you will be mentioned as sponsor in the ending credits of the film as well as on the official website. You are invited to a dinner with the director and parts of cast and crew, followed by private viewing of the film «Durch die Nacht». In addition you receive an exclusive prop and a signed DVD/Blu-Ray of the film, a signed screenplay, an exclusive «Durch die Nacht» poster, a copy of the soundtrack and an exclusive «Durch die Nacht» city map that points out the locations of the movie. Also, you will be mentioned as sponsor in the ending credits of the film as well as on the official website. You will be mentioned as executive producer in the opening and closing credits of the film and you are invited to a dinner with the director and parts of cast and crew, followed by private viewing of the film «Durch die Nacht» (for two persons). In addition you receive a signed DVD/Blu-Ray of the film, a signed screenplay, an exclusive «Durch die Nacht» poster, a copy of the soundtrack and an exclusive «Durch die Nacht» city map that points out the locations of the movie. In addition, you receive a handmade prop of our Artwork Designer, let yourself be surprised! After various shorts, «Durch die Nacht» is the first feature film project by Antagonist Pictures, a group of young filmmakers from Zurich, Switzerland.